Schneider Optics designs and manufactures C-Mount lenses for integration into megapixel cameras that are used in industrial inspection, robotics, machine vision, postal sorting, document scanning, and medical applications. These high resolution megapixel lenses are designed for 400-700nm operation and feature robust mechanical construction. Some lenses in the C-Mount line are available with fixed or variable focal lengths ranging from 4.8mm to 100mm for megapixel cameras with 1/2”, 2/3”, and 1” integrated image sensors. These same lenses can be controlled manually or through motorized control, and also feature an extended iris adjustment range for use in extreme illumination conditions. 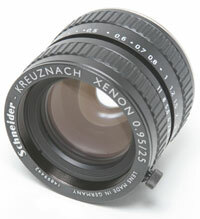 The C-Mount Lens line includes two Xenon high speed (f/0.95) lenses that have lockable focus and iris functions. The 17mm lens covers an 11mm image circle (2/3” format) while the 25mm lens covers a 16mm image circle (1” format). Additional information can be found in the available brochure. Schneider Optics VIS-NIR C-Mount Lenses achieve high optical performance through a sophisticated optical design and ultra-low dispersion glass. These lenses are available with manual, motorized, or with a video signal controlled iris, making them ideal for many different megapixel applications. They offer increased modulation, spectral sensitivity optimized for CCD cameras, improved illumination distortion, reduced color aberrations, minimal geometric distortion, and more.